Benefit Cosmetics recently launched their newest mascara the Badgal Bang. As a fan of most of their other mascaras, I was super excited about this new release and immediately purchased it from Sephora. I also thought it would be fun to compare this to my other Benefit faves including They’re Real and RollerLash. So what’s the deal with this new mascara? Now, I have to give it to Benefit with their unique marketing and a new formula for the mascara. This sounded very interesting and I was intrigued. I haven’t been disappointed with their mascaras in the past so I imagined that I would like it regardless. $32.00 CAD (8.5 g). I got the mini size for $17.00 (4 g). How does it Stack Up? 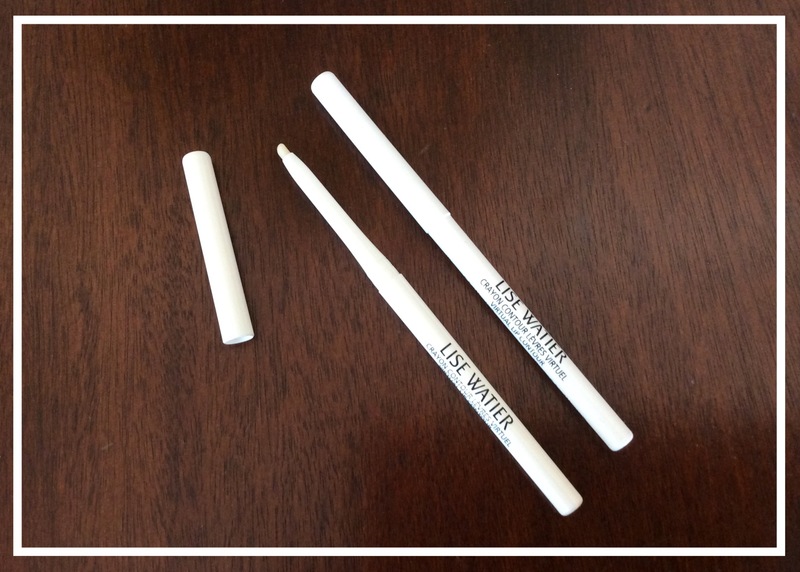 I have loved both the Roller Lash and They’re Real mascara for so many years now. I always keep one of each in my makeup collection at all times. I wanted to compare this new release and see if it performs any better or worse. To keep things fair I put one coat of mascara on. The photos taken are of the same eye in the same lighting (granted the day did start getting darker but I worked as fast as I could). I didn’t curl my lashes. I hope this gives a good impression of each. I thought this newest mascara both lengthened and made my lashes appear thicker. 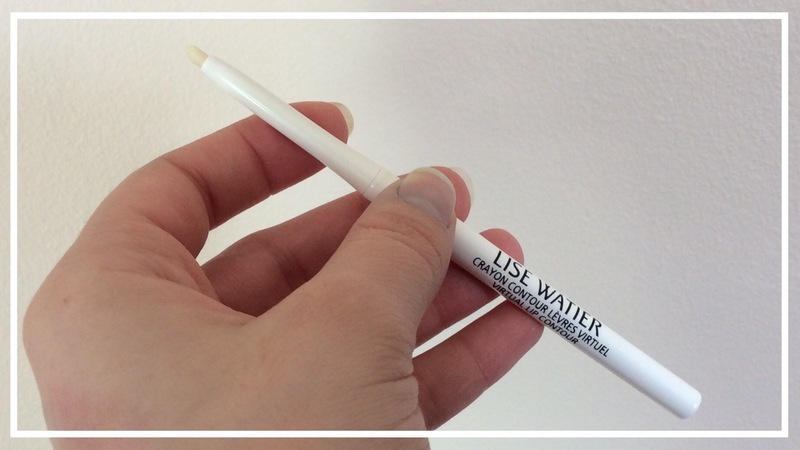 The formula does feel seriously light which is so interesting because it feels like nothing on my lashes. It’s also very soft to the touch, unlike both They’re Real and Roller Lash which can feel stiff when dry. Another difference between this and the other mascaras is the brush is very flexible so it glides over the lashes rather than brushes or tugs at them. The bristles are very short so a lot of product gets dispersed onto the lashes at once. One thing I didn’t really love about the brush tip is that it started clumping my lashes together so I had to comb the brush through a few times to get them to separate. The black is a crazy deep black, more than my They’re Real and it’s very shiny at first so my lashes looked like they were coated in vinyl. As is dried it looked a lot better. I must note that both BadGAL Bang! and They’re Real! are fresh new bottles. They’re Real! Is the first mascara I considered a holy grail. I went a whole year using only this product so I hold it dearly in my heart. In comparison to BadGAL Bang! this mascara really coats each lash and fans it out. I believe it’s because the brush is a lot stiffer and the actual bristles are longer to help comb in the product. After coating this on my eyes I realized right away that I liked this one much better. It looks like I have way more lashes. As far as formula goes, this is pretty liquid but not as much as the BadGal Bang. It’s also not as black in colour. The only Roller Lash I have to compare is this brown one which is a bit older so the formula has started to dry. What I love about the Roller Lash is that the curved brush hugs the lashes and helps pull them up as it coats them. Since I don’t ever curl my lashes, I feel like this helps to give them a slight bend. You might be able to tell in the photos that my lashes do look more lifted. It doesn’t give me as much volume or length compared to the BadGAL Bang! so I prefer the BadGAL Bang! over this one. Because the BadGAL Bang! brush is shaped like a cone (which is my favourite brush shape) it lifts the ends of my lashes nicely so give them a flirty and fanned effect which is similar to the Roller Lash. So this isn’t better then They’re Real for me, but something about the formula is really great because it’s lightweight and feels soft on my lashes. I like when my mascara starts to dry down a little so I’m hoping that in a month or so this will work even better for me. I will keep testing this mascara and see how it looks when I complete a full eye look. I have so many other brands of mascara that I love too so although I like this compared to other Benefit Mascaras we will see how this holds up to my ultimate favourite mascaras – Lancome’s Monsieur Big or Essence’s Princess Lash! Have you tried the BadGal Bang? What do you think of this mascara? What is your holy grail mascara? This weekend is the Canada Day long weekend, and for me, this is the true start to the summer! I’ll be headed up on a spa trip for a bachelorette in Chelsea, Quebec to enjoy a nice relaxing weekend. I will also be going into Ottawa again! I loved Ottawa the last time I was there and I’m looking forward to watching fireworks in our capital. With days in the sun and the summer just about to begin, I thought it would be a great time to remind everyone to get their SPF on! I’m taking two with me that I’ve been loving lately and I wanted to include them here. I also have a travel packing guide here. For the Face – Clinique Super City Block, SPF 40 I purchased this about a month ago because I really, really wanted an SPF for my face. I had been debating getting a powder SPF, but decided I would go for a cream. When I saw that Clinque had one with UVA/UVB sun block and antioxidants in 40 SPF I decided I would pick it up. This is is 100% fragrance-free! I’m not in love with the smell of sunscreen so I really appreciate that this has no smell. Not having a fragrance is great for me because it just makes this more comfortable to wear. You can wear this as a daily moisturizer but because I have dry skin I still mix in a little of my own creams for extra hydration and I find it helps the product spread easily. I use about a pea-sized amount of the sunscreen and moisturizer to cover my whole face. This is also oil-free which is great as well because it feels light on the face and makes it werable on more skin types. My only drawback with this su screen is that it has a tint. 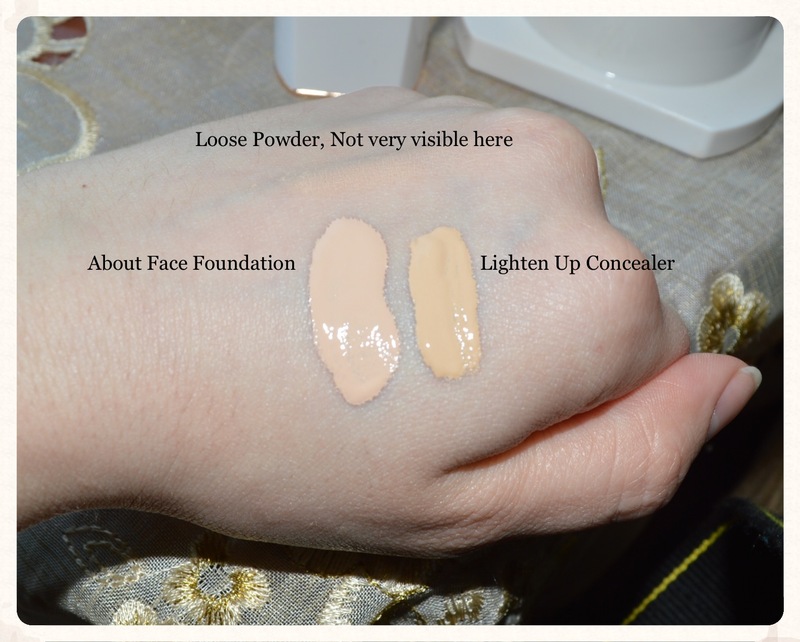 It blends in with my complexion well, but I’m not sure how it would look on other skin tones. I just wish it was a colourless cream. For the Body – Coppertone Clearly Sheer, SPF 30 I received this courtesy of the Canadian Beauty Blogger Network and with great timing because I had been looking for a new sunscreen for the body. This has a very nice, light formula that spreads really easily. It actually just feels like a moisturizer which is really nice. It claims to be breathable and good for sensitive skin. Most sunscreens can feel super thick which is why I tend to use sprays but this is not thick at all! It’s also not greasy and absorbs into my skin really quickly and after I apply it I don’t feel like it is going to leave a residue on my clothes or anything I touch. All these makes it comfortable to wear as a moisturizer every day which is how I have been using this. For those who want a sunscreen that is easy to apply and is weightless on the skin, I think you’d really like this. It does have a slight scent, but luckily it doesn’t smell like sunscreen. It’s more like a coconut/pina colada scent that is actually really pleasurable. This is probably the best a scented sunscreen has ever smelled! What sunscreens have you been enjoying for the summer? Happy Canada to all my fellow Canadians!! AND!!! Happy 4th of July to my American friends celebrating! 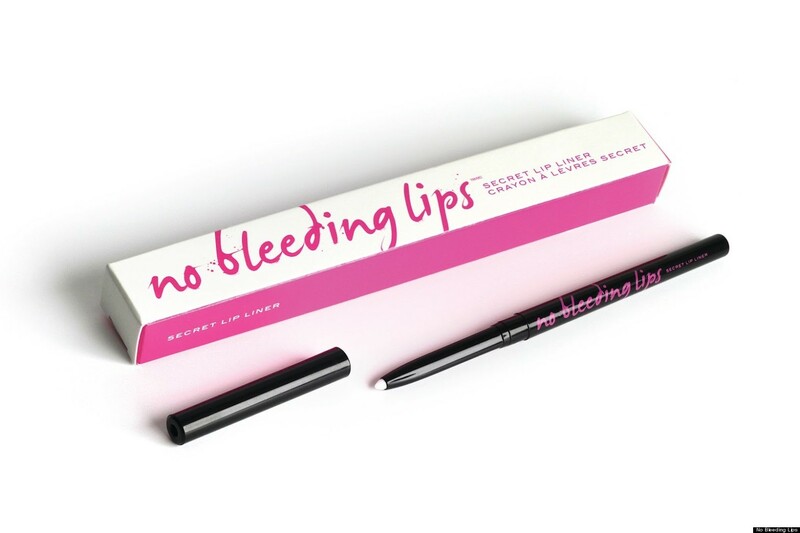 It’s really hard for me to say no to a good set of felt tip eyeliners, especially when cute packaging is involved. 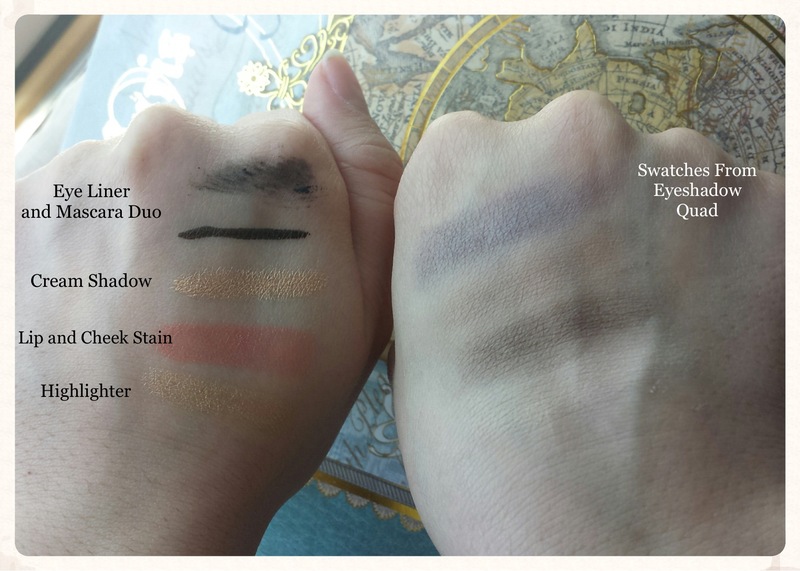 Yesterday I was shopping and chatting with the lovely Cat from mylipaddiction.com at Sephora when I remembered I needed new eyeliners. This set caught my eye and after swatching the colours in the store I decided to pick it up. We got a few fun and much needed things. Cat picked up a beautiful Sephora Gloss and the Nars Concealer in Vanilla. 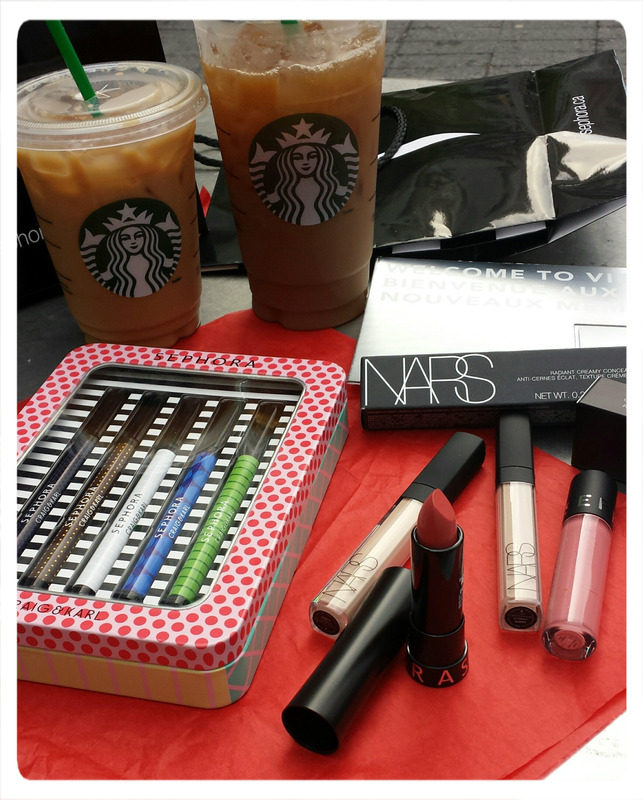 I also grabbed the same concealer, the Sephora Eyeliner Set and a Sephora Rouge Cream Lipstick. I really wanted to add a few colours to my makeup look, and because I’m into neutral eyes, I thought colourful eyeliners would be a nice way change it up. Packaging: The tin is totally cute and colourful, designed by two artists Craig & Karl based in London and New York. I can reuse it to store all my eyeliners. 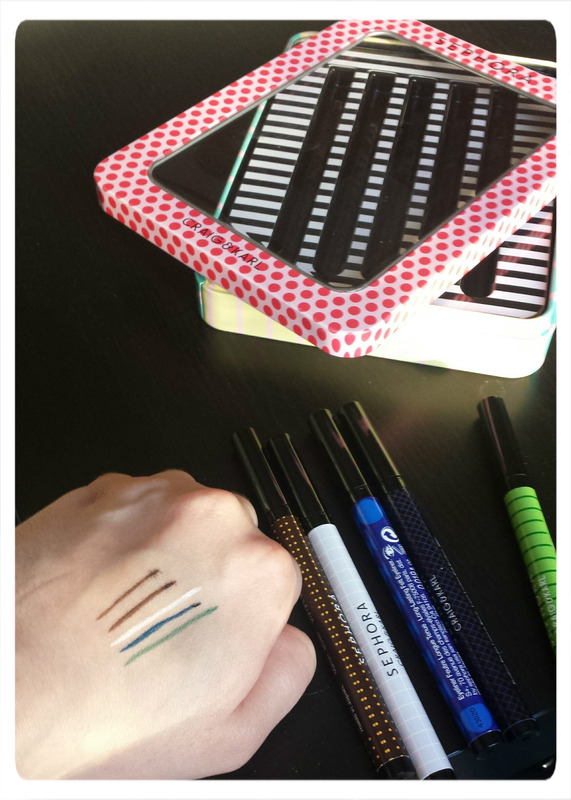 I really like that the eyeliners themselves have their own designs which helps distinguish them. Application:These liners are thin! I love that you can really get a precise line with them. Colour:Two of the colours looked more dark brown which is disappointing because I thought one of the colours would be black. Regardless, what I really got this for was the coloured liners. The blue is a beautiful cobalt colour, leaning towards teal. The green is a deep jade which I am completely in love with, it was the first colour I wore out of this collection. Lastly, the white is a very soft white but the pigmentation is amazing. Cat suggested wearing it on top of a black liner for a black/white wing and I may try that. Longevity: I wore the green and brown liner all day today and looking at it now it’s still as strong as when I first wore it. It dries immediately after application and there is no flaking or bleeding (the colours did bleed a bit when swatched on my hand, but not on my eyes). The liners are not waterproof, but the swatches on my hand got wet and they mostly stayed put, a good sign I think. I’m really happy I picked this up. I think the colours are great and are easy to wear everyday. Have you tried this set? 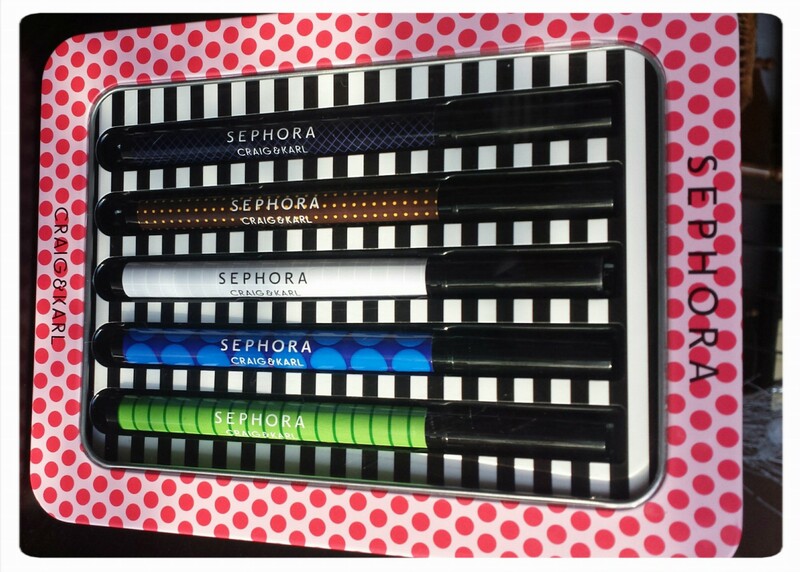 What do you think of Sephora’s Eyeliners? I was shopping at Walmart today and happened to walk by the beauty section….ok, no, I practically went to Walmart to buy dish soap and makeup! 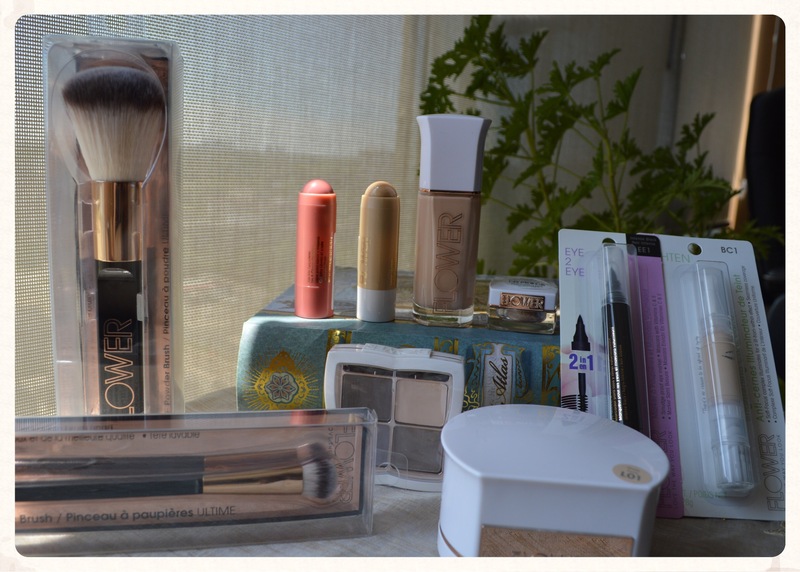 I wanted to get a few things I needed; a hightlighter or maybe a concealer because we all know that sometimes drugstore makeup can be just as good as beauty store makeup and I wanted to try some new items out. 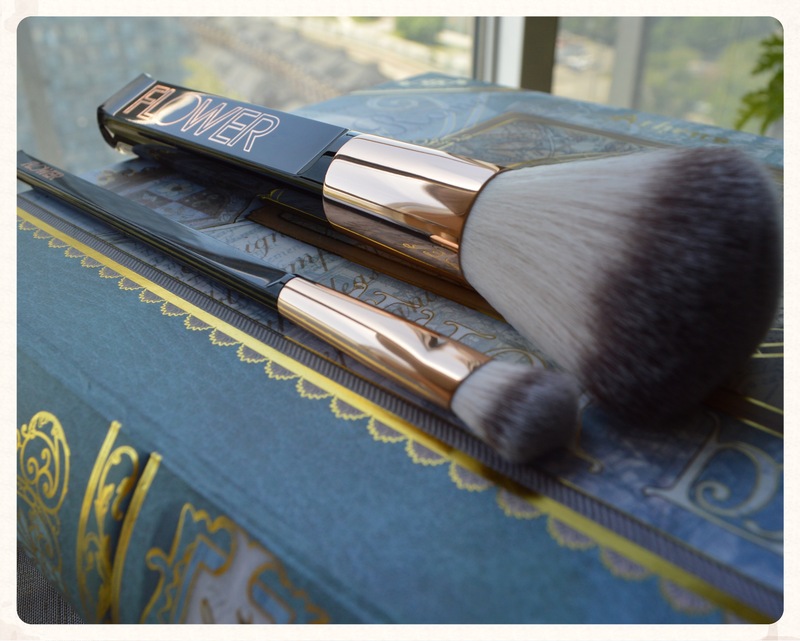 Then it hit me, the beautiful face of Drew Barrymore promoting her makeup line, Flower Beauty, and I decided that I wanted to try it for myself. 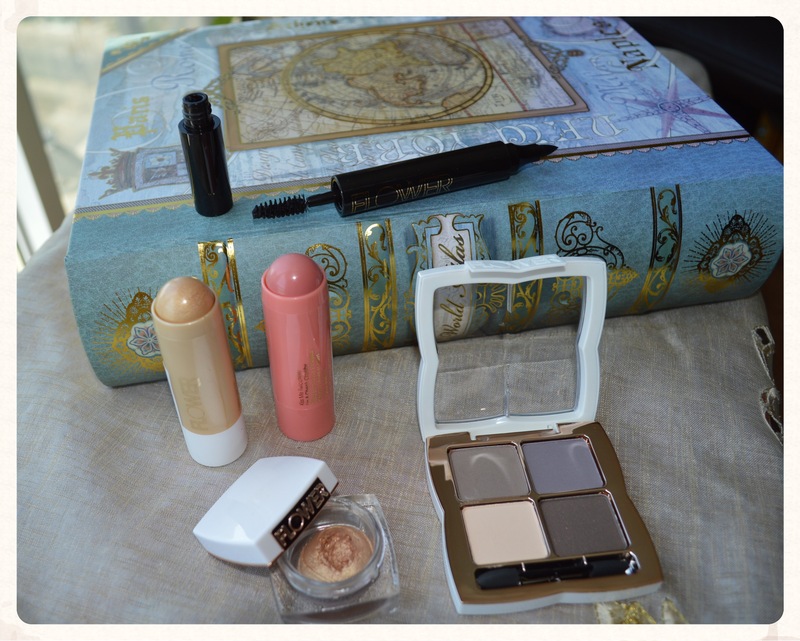 I bought items that I would use in an everyday makeup look to see how well they would compare to the current products I have. These brushes are made with man-made hairs but they are extremely soft and nicely dense. 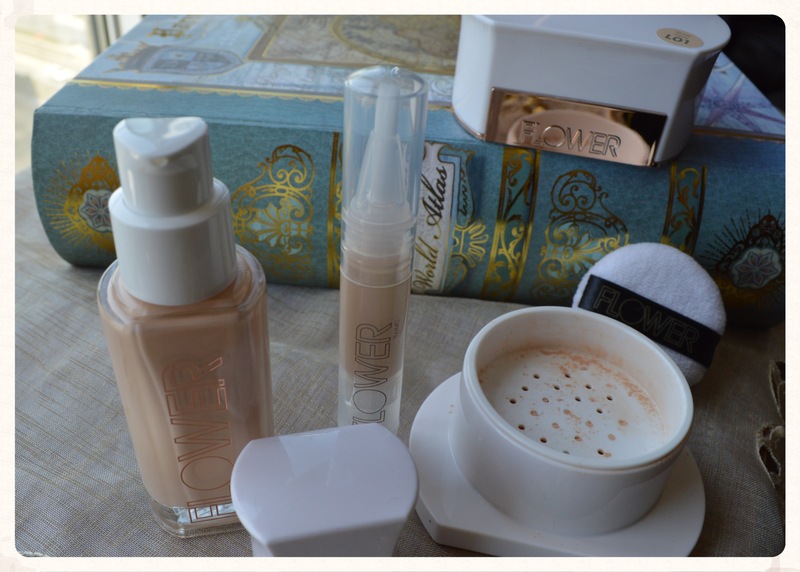 At first swatch these products feel super nice and creamy, the colours match my skin tone well. I will wear only this line for the next few days and do a blog post on my thoughts of its wearability. What do you think of Flower Beauty?